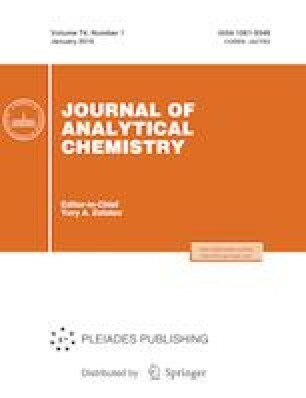 An extraction-spectrophotometric method has been developed for the determination of trace molybdenum(VI) using a newly synthesized benzopyran derivative, 3-hydroxy-2-[3-(4-methoxyphenyl)-1-phenyl-4-pyrazolyl]-4-oxo-4H-1-benzopyran (HMPPB). The method involves formation of a 1 : 2 (M : L) yellow complex between Mo(VI) and HMPPB from 0.02–0.06 M H2SO4 medium. The Mo(VI)–HMPPB complex is easily extractable into carbon tetrachloride with 100% extraction and exhibits maximum absorbance in the wavelength region 417–423 nm. The method is made sensitive and selective to produce best extraction results by studying and optimizing parameters of acidity, reagent concentration, equilibration time and effect of diverse ions. The optimized method shows a good range of linearity (0–1.4 µg/mL), sensitivity (0.0018 µg/cm2), limit of detection (0.1 µg/mL), correlation coefficient (0.9974), accuracy, and reproducibility (±0.002 absorbance units). The proposed method is satisfactorily applied to the extraction and determination of molybdenum(VI) from different synthetic and technical samples including steel, flue dust and water samples. Thanks are due to the Authorities, Maharishi Markandeshwar University, Mullana and Kurukshetra University, Kurukshetra for providing laboratory and other desired facilities.